Well, I'll confess. I've always been something of a Silver Age comic book fan. Those classic Marvel comics of the '60s and '70s will always be among my favorites. Captain America had already been around when my Dad was a lad, so I can understand his wry smile when I told him about the return of Captain America with the Avengers in the early '60s. He thought I was talking about John Steed and Emma Peel of course. Today, Cap gets a reboot again, this time on the big screen, after two made-for-TV versions that are among the worst ever made. With Marvel's successful X-Men 1,2,3 and 4, Iron Man 1 &2, Thor, Hulk 1&2, Spiderman 1,2,3 and soon 4, as well as the marginal Fantastic Four 1 & 2, Daredevil and soon Conan, it was only a matter of time before the Star Spangled Avenger would be added to the Marvel/Disney mix. 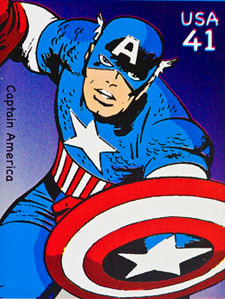 In the original comics, Cap re-emerged in the 1960s from the 1940's. How did this latest reboot of Cap fare, re-emerging in 2010s? The real miracle was the late, legendary Jack Kirby (1921-1994), Marvel was fortunate to have the incredible Kirby, artist of the original Captain America comics, draw the reboot along with writer Stan Lee. Kirby was one of the greatest comic artists of all time and it would be he and Lee, who would bring titles like the Fantastic Four, X-Men, Avengers, Hulk, Thor and so many others to life. In the comics, Cap is initially found in a block of ice by another Golden Age/Silver Age Marvel hero, Prince Namor, the Sub-Mariner. Namor promptly hurls the ice back into the drink, unaware that his fellow hero is inside. Enter the Avengers, Marvel's newest comic heroes featuring Thor, Iron Man, Giant Man and the Wasp, who find the drifting Captain America. Needless to say, a startled Cap revives in a world he never made, however the Avengers would soon make him one of their own after he saves them, and the rest is comic book history. The new film has no Namor unfortunately, and the Avengers are only revealed in the closing credit teaser, with cameos of Samuel L. Jackson as Col. Fury, Robert Downey as Iron Man and Chris Hemsworth as Thor. There were a few other additions from the comics; Peggy Carter/Agent 13, (portrayed by Hayley Atwell), and "Dum-Dum" Dugan & Gabe Jones, (Neal McDonough & Derek Luke, respectively), were characters from "Nick Fury and His Howling Commandos". Nick Fury is played by Samuel L. Jackson in the Marvel films, however the original Nick Fury in the comics was white. In Marvel's "alternate universes", this is apparently just another 'reality". I keep telling myself that whenever I watch these films, in the hope the stories still work. Some do, some don't. Captain America does. The biggest challenge for Captain America for me however, is not his story; very well told and acted by Evans and his mentor, Dr. Erskine, delightfully played by Stanley Tucci, (Tommy Lee Jones as Col. Hollips was also well cast), it was how to handle the star-spangled, propoganda, the cartoonish-military machine of the comic book era, without losing Cap's humility, humanity and morality by making it look stupid. Fortunately, director Joe Johnston does well, given Marvel's "out-of-this-world"-plot. The screen writers also did a good job of putting the struggle of 1940s New York, Cap'/Steve Rogers heroism, and the need to become than just a symbol of democracy for the USO and "the boys over there". These folks could have made this campy and a little hollow. Johnston films it with the right touch of gritty irony emblematic of those Cap stories from "Tales of Suspense"
There's plenty of action too; the evil Hydra, 3-D special effects, pyrotechnics and yes, Cap throws his mighty shield. Marvel's "The Avengers" due out in 2012, is the piece that will unite "Earth's Mightiest Heroes" for a big time throwdown. I'm not going to say "to big to fail", but any film with Iron Man, Thor, Hulk and some of Marvel's nastiest villians would be impossible to screw up. That being, said, I'm really glad that Captain America will also be there to keep them honest. Just like the comics.